Hot peppers, or chilis, get their heat from an oily chemical compound called capsaicin, found primarily in the membrane surrounding the seeds. Capsaicin boosts thermogenesis -- the process by which the body turns calories into heat to use for fuel -- in studies on humans and animals. The effect is slight, however, and you won’t speed up your metabolism to lose weight just by eating hot peppers. To shed extra pounds, you’ll need to balance the calories you take in with the amount you burn off every day through physical activity. A number of factors beyond your control determine your basal metabolic rate, or BMR, which is the amount of energy you need to carry out normal bodily functions. Your genes may predispose you to a slower metabolism, for example. Age and gender are also factors -- your BMR decreases 1 to 2 percent per decade, according to the American Council on Exercise, and women have lower BMRs than men. People with slower metabolisms likely have more fat than muscle mass, with fat requiring less energy for your body to maintain than muscle. And, if you've gained weight no matter what you've tried, a medical condition, like a thyroid disorder, may have slowed your metabolism, and you need to consult a doctor. This isn't to suggest you have no control over your weight. Weight gain still often comes down to a formula -- when the number of calories you take in is consistently greater than the amount you need and that you burn through activity and exercise, you put on pounds. In general, 3,500 calories equals 1 pound of body fat, so if you consume 500 extra calories a day without burning them off through activity, you’ll gain a pound in a week. A few foods encourage thermogenesis, including protein foods, foods containing caffeine, green tea and hot chili peppers. In the case of hot peppers, however, you would have to eat them regularly at a very high dose to lose weight, according to an article in the American Journal of Physiology in 2007. Their pungent flavor makes this difficult to do. Adding hot peppers to your diet supports weight management and overall good health because they are low-calorie and full of nutrients; but don’t expect your weight-loss results to be anything but modest, say the authors of a report published in Chemical Senses in 2011. Among the other nutrients offered by hot peppers are vitamin C, A and E and potassium. A tool called the Scoville scale, invented in 1912 by a pharmacist named Wilbur Scoville, measures the heat of chili peppers. The greater the number of Scoville heat units, or SHUs, the more capsaicin the pepper contains -- and the greater effect it will have on thermogenesis. Among the most common chili peppers found in food markets, the hottest are habaneros and Scotch bonnets, with 500,000 to 1 million SHUs. The long, slim cayenne pepper boasts between 250,000 and 500,000 SHUs, while tabasco peppers have 100,000 to 250,000 and Thai chili peppers have 50,000 to 100,000. Jalapeno and serrano chili peppers are modest by comparison, with just 5,000 to 25,000 SHUs. Another quick way to measure the heat of a pepper is to look at the stem, according to the American Chemical Society. The thinner the stem, the hotter the pepper -- and the more capsaicin. 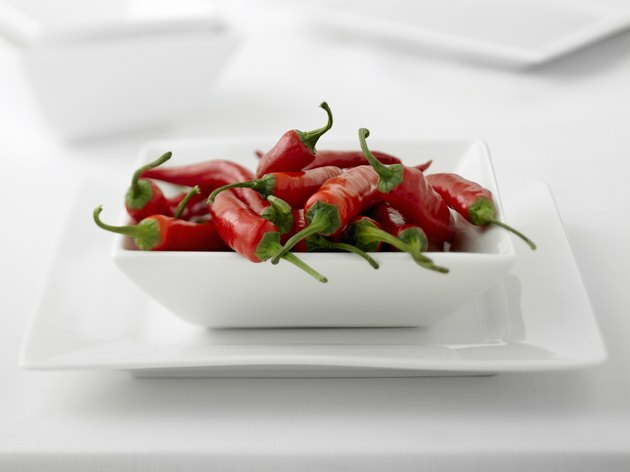 Red-colored peppers are hotter than green, and dried peppers contain a higher concentration of capsaicin than fresh. When you bite into a hot pepper, you may feel like your mouth is on fire. The ACS suggests drinking milk or eating cottage cheese to quell the flames. The casein in dairy foods overwhelms the capsaicin and removes it from your tongue. Similarly, starchy foods like bread can help put out the fire. Trying to eat too many hot peppers at once in an effort to “speed up” your metabolism can backfire. If you aren’t accustomed to these spicy veggies, your throat may swell, says the ACS, requiring medical attention. In addition, your body may perceive the peppers as toxic and cause you to vomit. ACE: Is It True That Metabolism Decreases With Age?